An accused kidnapper was back in court in Montgomery County. KING OF PRUSSIA, Pa. (WPVI) -- An accused kidnapper was back in court in Montgomery County. 32-year-old Cherie Amoore sobbed throughout her preliminary hearing in King of Prussia Thursday afternoon. She's charged with kidnapping and long list of other crimes. She left court without any comment. Her attorney Marc Steinberg says his client's state of mind is "confused, emotional, upset, and not clear." Amoore is accused of abducting 7-week old Ahmir Simmons on the evening of March 31st at the King of Prussia Mall. She allegedly approached the child's mother and sat with them in the food court. PICTURES: The family of a 7-week-old baby kidnapped from the King of Prussia Mall reunited with the boy at the Upper Merion police station. While the infant's mother tended to her other child, a toddler, Amoore allegedly took the boy from his stroller and ran off. When surveillance video was released following the abduction, Amoore's family called police. They found her and the boy at her Tredyffrin Township apartment. Court documents indicate she told investigators she had been pregnant, but the baby didn't live long and passed away in February. She told them, "I held him and all those feelings rushed back. I just wanted my baby. It felt I was holding my son again. It felt so good. I didn't want to lose that feeling." Her defense attorney said she is undergoing mental health treatment. "It's open and closed as to what happened. What's not closed is why it happened and the case will wind its way through the court. We'll be able to show evidence as to why it happened," Amoore said. 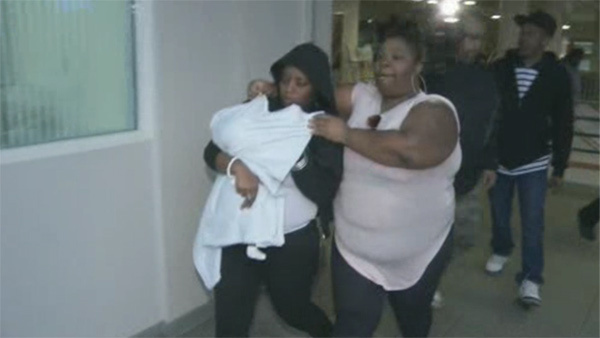 The mother of the abducted child, Malika Hunter, was in the courtroom with her family. She left early on in the testimony because she couldn't bear to watch the surveillance video of a woman walking away with her baby boy. Amoore's attorney said his client did have a baby shower with more than 100 people in attendance, but he would not say if she was ever actually pregnant or gave birth herself. She will be back in court in Norristown for her arraignment in June.